Identify the location and the orientation of the photographer. 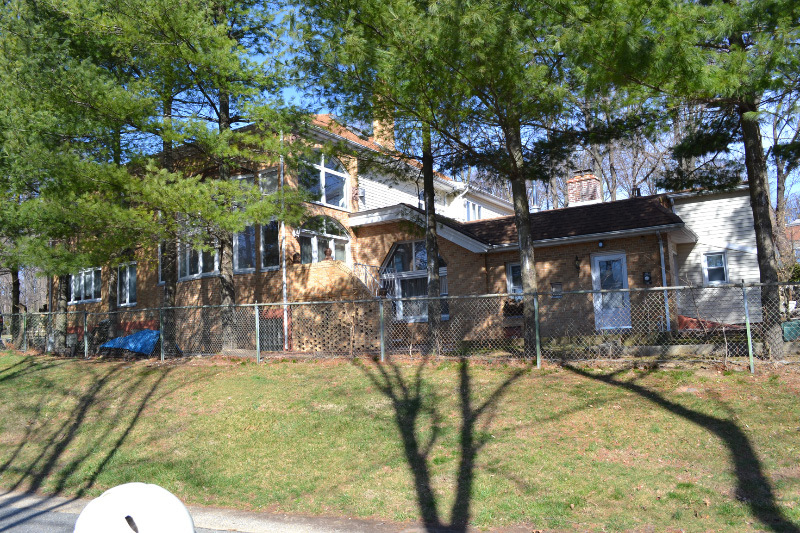 About 310 feet east of Lakeville Road adjacent to the Long Island Motor Parkway right-of way. The photographer is looking northeast. When was this building constructed and for what purpose? The building was constructed in 1909 as the Great Neck Lodge. It was one of the original six gate lodges designed by architect John Russell Pope. 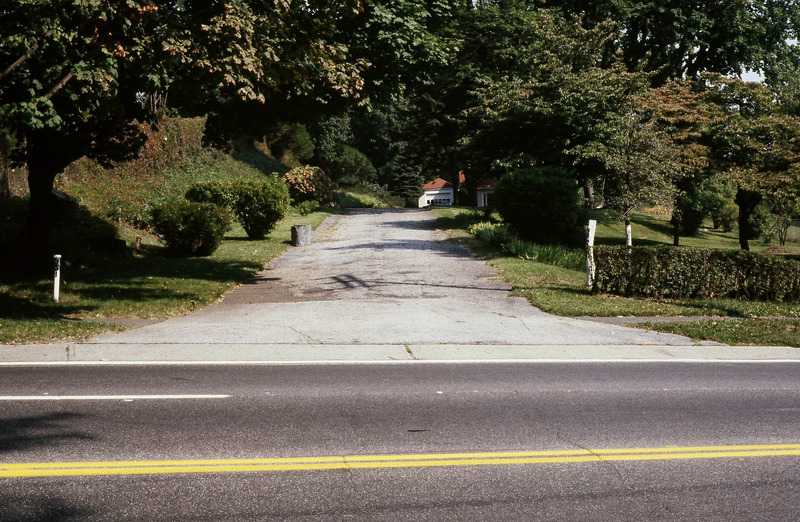 The photo was taken in 1981 by Ron Ridolph on his journey to document the Motor Parkway. Why was the berm created in front of the building? The berm is the remnants of the eastern embankment of the Lakeville Road Motor Parkway Bridge. Congrats to Greg O., Joe Osterle, Frank Mendyk, David I., Tim Ivers, A.Ward, Steve Lucas, Frank Femenias, Dave Russo, Sam Berliner III, and Art Kleiner (see below Kleiner's Korner) for identfying the Great Neck Lodge. 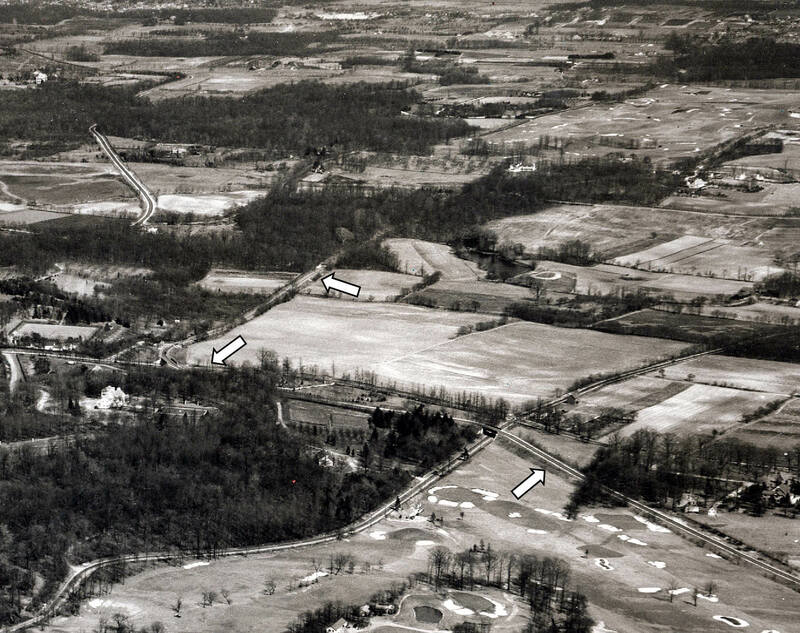 Kudos to Greg O., Frank Mendyk, David I. and Sam Berliner III for recognizing that the berm was linked to the eastern embankment of the Lakeville Road Motor Parkway Bridge. The former Great Neck Lodge looking northwest. 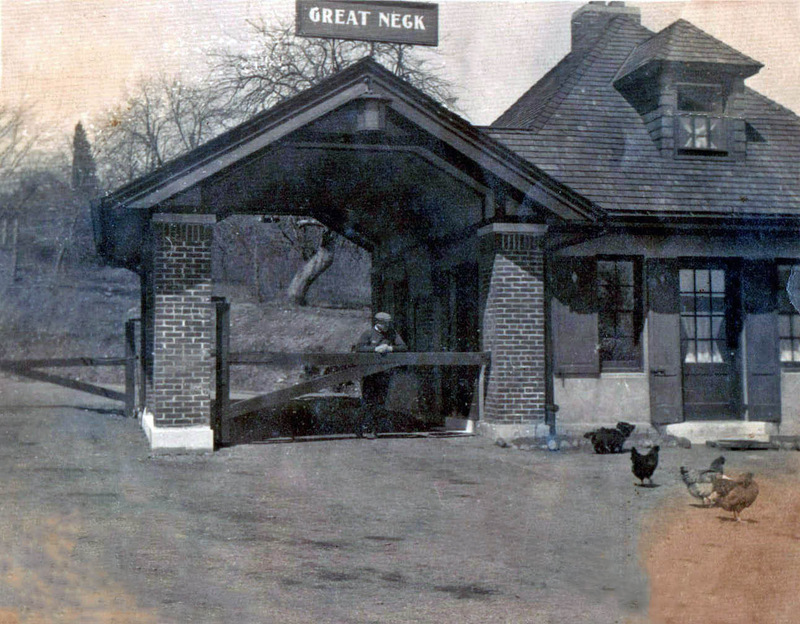 The former entrance to the Great Neck Lodge from Lakeville Road. The bench was sitting on the section of the Motor Parkway entrance/exit from the Great Neck Lodge. Motor Parkway used as a comm. enterprise. A close-up of the aerial looking east is probably the best view of the Lakeville Road Motor Parkway bridge. 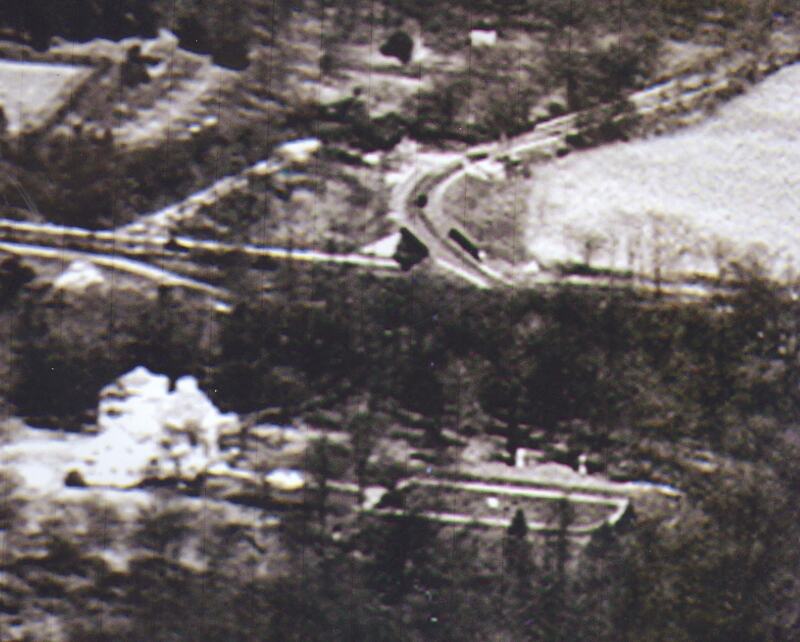 Note: William K. Vanderbilt Jr's former Deepdale mansion can be seen just below the bridge. Looking west from the bridge. Circa 1930. 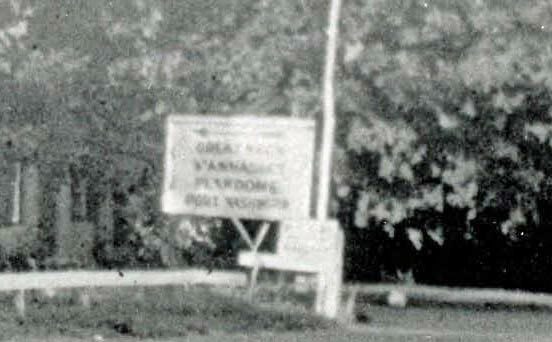 The sign indicated the direction fto take for Great Neck, Manhasset, Plandome and Port Washington. Looking east with the Great Neck Lodge in the background. Note: The berm on the norm side of the Motor Parkway right-of-way. 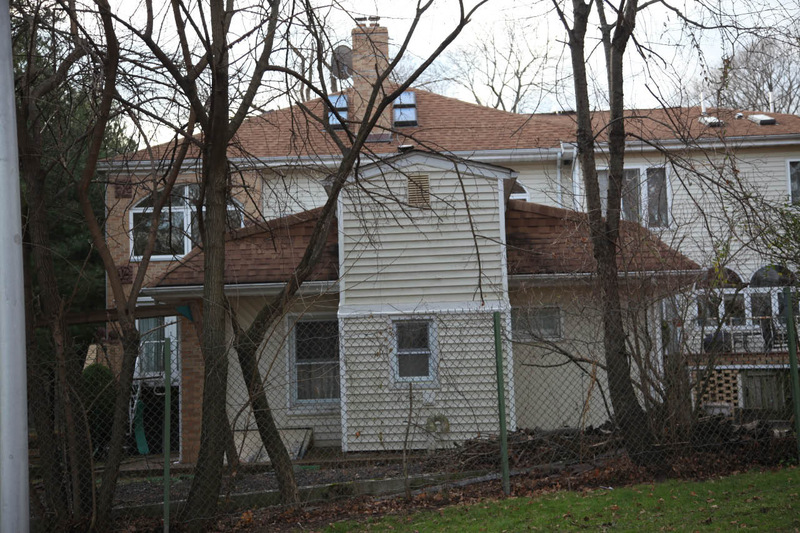 Originally the Great Neck toll lodge looking East along the LIMP/ now Great Neck South HS jogging path. Taken by Ron Ridolf in the 70’s before the 80’s and later expansions. I’ll guess the berm was from removal of the bridge embankment and provide privacy to the home. Great Neck lodge. One of the original 6 designed by John R Pope. Just east of where the LIMP crossed over Lakeville Rd. Berm is the entrance portico. Picture is probably from 1981, since that is when Ron took many of his pictures. The old lodge is not been assimilated into a much larger home. The photographer is taking the photo from the middle of the LIMP facing northeast towards the old Great Neck Lodge. The photographer is just west of the lodge on the LIMP. 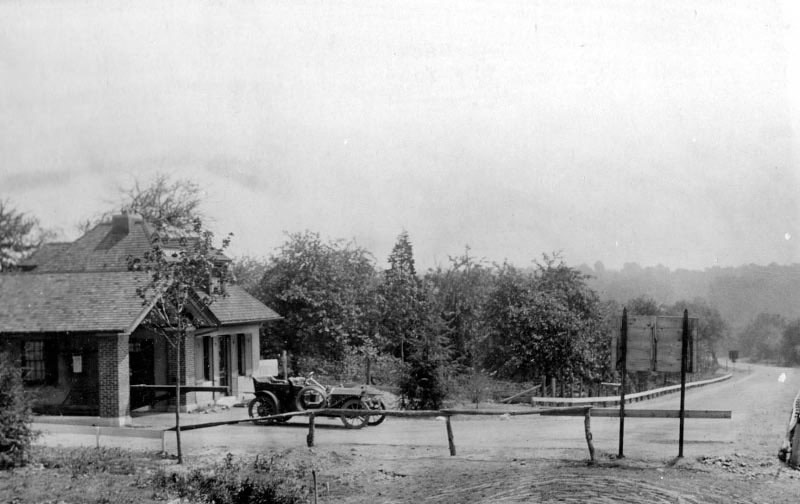 The building was constructed for taking tolls and for the lodge keeper to live in when the parkway opened. The berm in front of the lodge was created when the Lakeville Rd bridge and overpass was removed. The new section of roadway was graded to match the new road grade at Lakeville Rd. The photographer is on the re-graded LIMP looking northeast at the Great Neck Lodge in Lake Success (built 1909?). 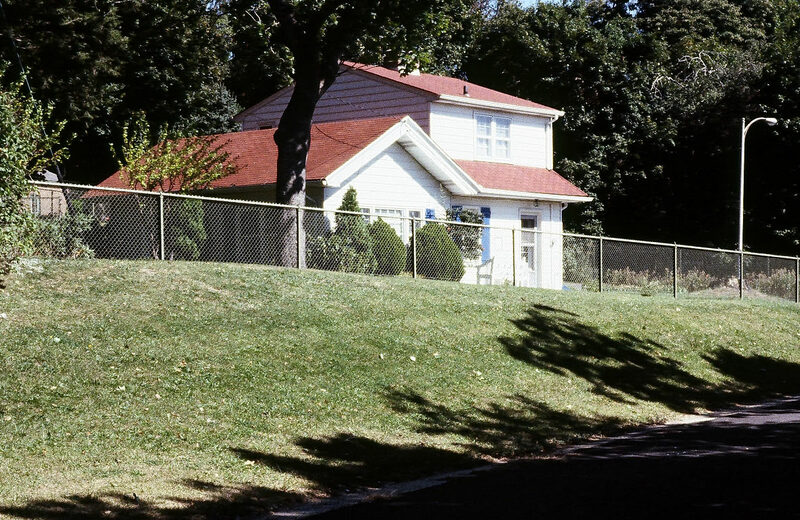 Don’t know when they started building the new super house onto it, but the low (4 ft) chain link fence was put in front of the house by the school in either 1957 or 8 so this could easily be any time in the 1960s, 70s or even early 80s depending on when that red/orange roof went on. 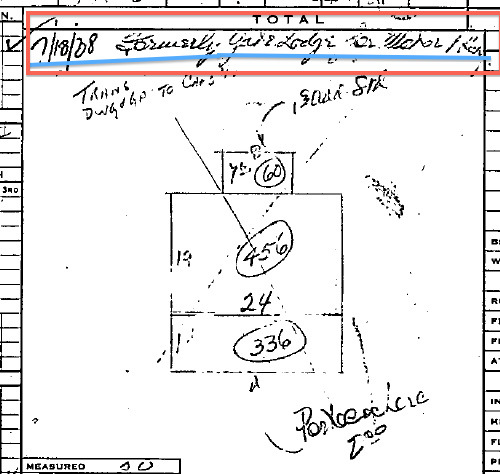 a) The berm might have been at the original grade to the Lakeville Road bridge?? b) It coulda just been earth bulldozed up when re-grading down to meet level with Lakeville Rd.?? 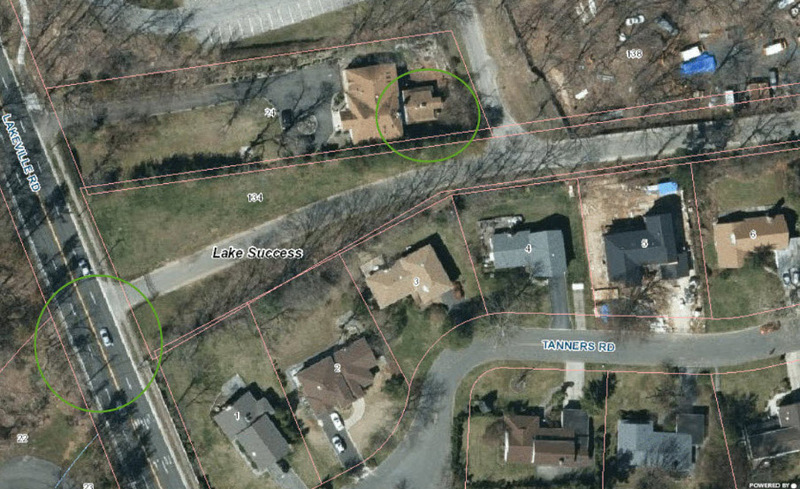 c) If it was purposely added, it might be because eastbound on LIMP over the diagonally crossing bridge with a continuing eastward curve east of Lakeville Rd, the cars (at 1 time with NO speed limit) would have been pointing right at the lodge…a protective measure?? d) North of the lodge is very steeply uphill. It may be to channel water runoff east-west instead of flooding over LIMP?? 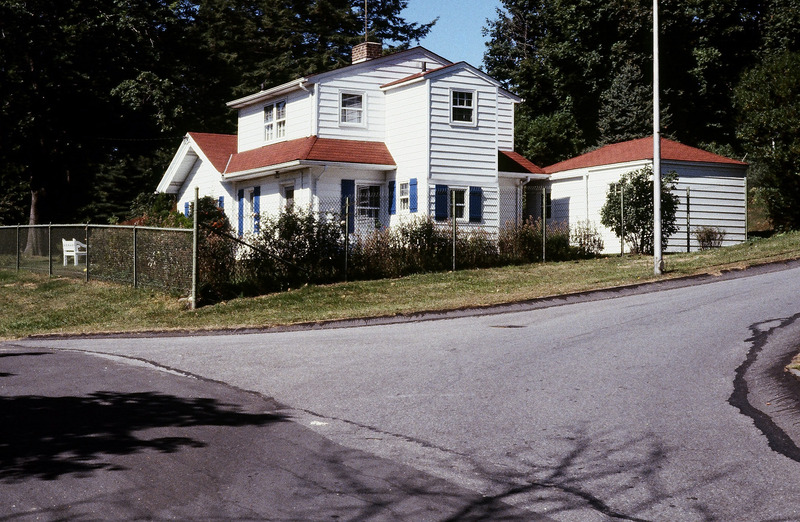 off Lakeville Road, built about 1908 with this photo from the 1980s, looking northeast. It was at one time the LIMP western terminus. Merry Christmas to Howard and everyone on this website. 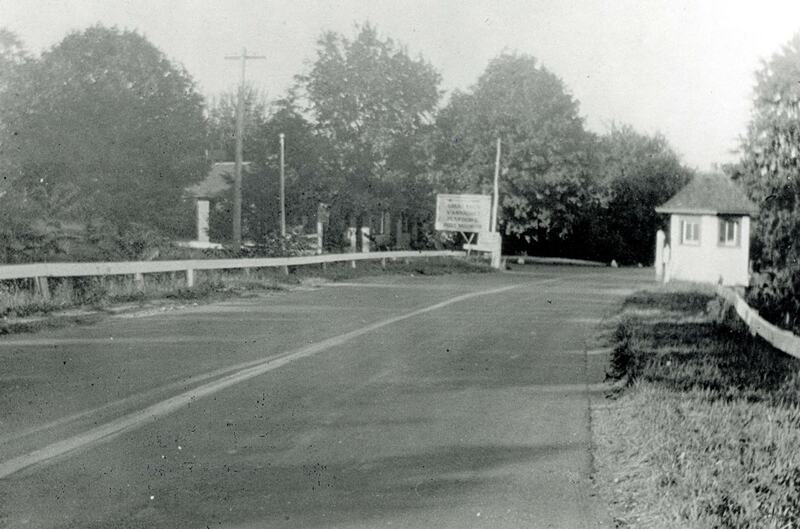 This is the lodge and toll gate for the Lakeville Rd., looking northeast. Next to this photo is a well kept 1/3 mile section of OMP thru the old Phipps Estate, now Great Neck MIddle School complex. I think we’re looking northeast on the LIMP slightly east of Lakeville Road. 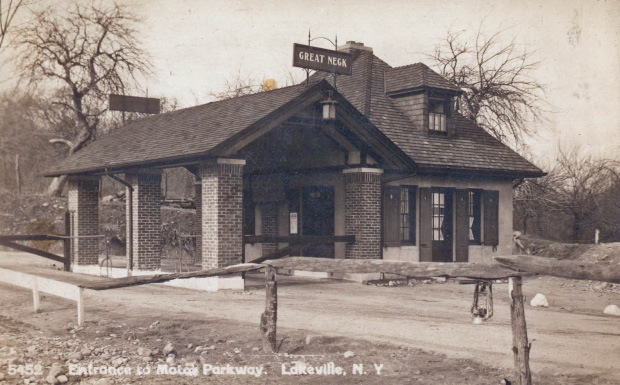 The building was constructed in 1909 as the Great Neck toll lodge. Photo was probably taken in 1981 during Ron’s “walking tour” of the LIMP. Not sure, but I think the berm was created when the roadway was re-graded lower to allow access directly from Lakeville Road to the athletic fields of Great Neck High School. Without searching, and if memory hasn’t burned out like the Christmas tree lights this year, it’s the Great Neck lodge just east of Lakeville Rd in Lake Success. We’re looking NE, during Ron’s infamous Motor Parkway tour in 1984. This photo shows the lodge in it’s near original configuration. Today, it’s barely recognizable with extensive renovations. Guessing it was constructed in 1909 during second phase of LIMP construction, where it also served as the western terminus near Willie K’s Deepdale estate. 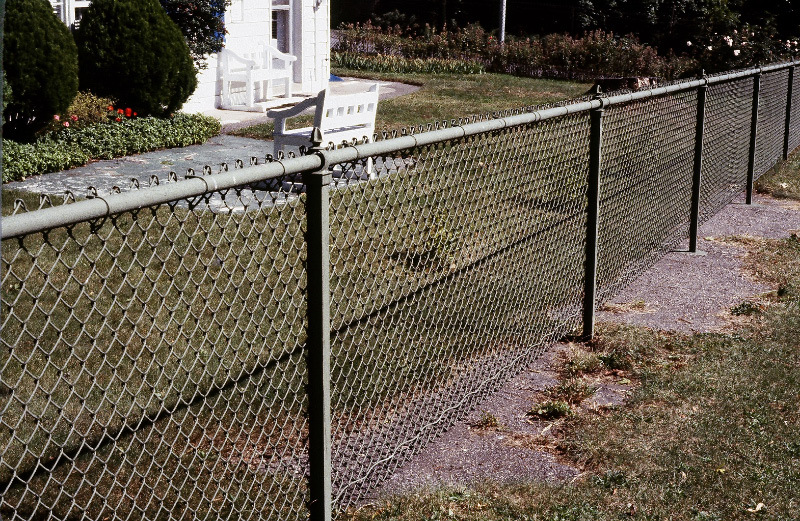 The Motor Parkway is just on the other side of that fence between the lodge and fence. It’s still there today and remains one of the most preserved stretches of the roadway. It was great seeing the video of the Black Beast roaring through there recently, just like the ol’ days. Happy Holidays to all and hoping for a blizzard very soon. Great Neck lodge. Easy one! Great Neck school complex. Currently a private residence. Built in 1909 to be the western terminus. View is looking north, photographer probably on the Motor Parkway roadway. Date of photo 1960s. 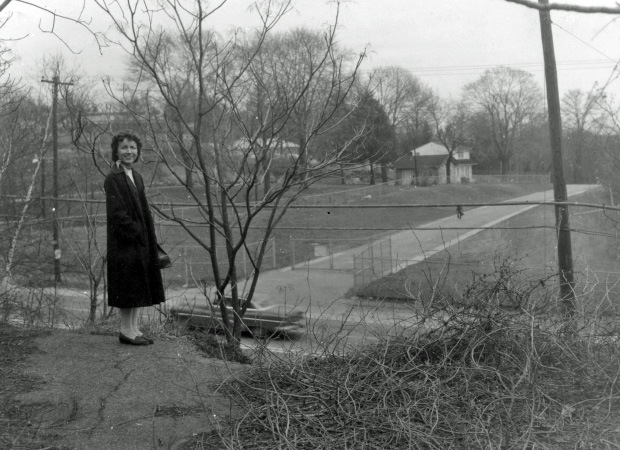 Berm was for the Motor Parkway entrance. Looks like a 1953 Buick passing by in the 1960 photo. Brian and I explored this area last year and we were able to determine the separation point between where the newer concrete extensions commenced from the original. The difference was barely visible by naked eye, you really had to look hard (the granular concrete mixture was slightly different from the original, as well as the color, also barely different). I took pics at that point and hope photography grasped the difference. Looking for the pic now and will send it in.